At Steel Magnolias, our food base is urban Southern, taking the roots of classic Southern cuisine and showing a new way of looking at them. We serve our fare with an old familiar smile, where our patrons are surprised by a new approach, yet still know the secret handshake. We prepare the best quality ingredients at the freshest possible point and allow them to speak for themselves. We support local farmers and Artisan producers in an effort to become a supporting element in the community and drive our “eat local, be local” philosophy. The Violante family immigrated to the United States in 1956. Nino Violante, along with his parents, Barbara and Giuseppe Violante, opened a small restaurant in De Funiak Springs, Florida. They had two tables and a counter to serve people. Times were very different and not many Italian products were available in the south. The Violante family made their own fresh mozzarella and parmesan cheeses. Nino was convinced that the ‘Americans’ didn’t like Italian food. He thought the family should learn to make hamburgers because it seemed as though that was all Americans ate! Times certainly have changed… Osvaldo Pistelli and his family immigrated from Ancona, Italy in 1973 to Tallahassee, Florida. Osvaldo, Tita (Violante), Massimo, and Danilo learned the restaurant business for the next five years from Nino and IsoldeViolante and Gary and Diana(Violante) McLean. In 1977, Osvaldo Pistelli and his family moved to Thomasville, Georgia to open their own restaurant. It was in Thomasville that Massimo met his future wife, Cynthia Fragakis, whose family was Greek and also owned a restaurant. Massimo and Cynthia married on July 4th, 1983 and became partners with Massimo’s parents at the Thomasville Mom and Dad’s Restaurant. In 1986, two years after the birth of their first son, Giuseppe, Massimo and Cynthia moved to Valdosta, Georgia to open their own restaurant. Vito, their second son was born in 1988. Since then, Mom and Dad’s Italian Restaurant has been serving Lowndes County and the surrounding areas. Massimo and Cynthia are both semi-retired but still go to the restaurant daily. Cynthia continues to make desserts from scratch while Massimo assists Giuseppe with book keeping and ordering. Timmy and Calvin Troupe have been cooking with the Pistelli family for more than twenty years and are part of our extended family! Home of the Brisket Sandwich. At Smok’n Pig we use the finest quality pork, chicken, turkey, and Sterling Silver® beef to serve you. Bar-B-Q slow cooked daily with pecan wood... never dry, always lean and juicy inside. It is our goal daily to prove that we are only as good as our last meal. We feel that Bar-B-Q should never be eaten alone, always with friends and family. It’s our goal at the Smok’n Pig to be that gathering place with a southern tradition and old time Bar-B-Q, freshly prepared country cookin just like grandpa used to do back in the day. So relax, sit back and enjoy. As the name suggests, Bubba Jax Crab Shack is a seafood restaurant specializing in local shrimp and crab. A great choice for a low-key yet hearty and tasty meals, the menu at Bubba Jax features an abundance of delicious starters such as Bubba Bang shrimp, fried oysters, Louisiana crawfish and gator tail. The entrees are equally tempting, especially the soft shell blue crab served with a choice of two sides and hushpuppies. Tables of four or more are encouraged to order the Bubba Jax combo. A deliciously fresh selection of snow crab legs, boiled shrimp, crawfish, corn, sausage and potatoes – this is the real Bubba Jax experience. Looking for a wonderful dining experience? Look no further than 306 North Restaurant! They are a locally owned and operated restaurant that features a blend of Southern sophistication in a classic and comfortable environment. At 306 North, they strive to provide great food using locally provided ingredients, including fresh produce, cheeses and farm raised meats. Go visit them for a refreshing and delicious meal or to enjoy a drink from their extensive wine list. Specializing in steak, seafood and prime rib, Austin’s Cattle Co is the type of restaurant to visit on an extremely empty stomach. The dishes are generous in both size and flavor and the fare on offer is a meat lover’s dream. Austin’s in-house butcher cuts the steaks fresh daily ensuring that none of their beef is ever frozen. Different cuts on offer include the classic rib-eye, filet mignon and t-bone, as well as the delmonico and filet kabob. Seafood enthusiasts will appreciate the vast selection of fresh catches available each day. These include Cajun grilled shrimp, Gulf grouper, grilled tilapia and farm-raised catfish. Loved for its crisp empanadas packed full of flavor, Empanadas and More is the perfect stop off for a quick and tasty snack, simple lunch or delicious Saturday brunch. The empanadas on offer include both Caribbean and Colombian variants and come stuffed with a choice of beef and potato, shredded chicken, ham, or cheese. Daily lunchtime specials are also available for diners seeking a healthier, non-fried alternative. Tuesday’s pork chop stew and Friday’s beef meatballs are both particularly good. The Bleu Cafe features a great atmosphere, great beer, and great food. It has one of the best restaurant ratings in the Valdosta. The Bleu Cafe has a wide variety of California Mex and Pizza. Quality fresh ingredients in each dish! Stop on by and grab a bite when you are downtown! Some of the best seafood in South Georgia! Their main goal is to provide you with a great experience through food, drinks, service and atmosphere. Stop by when you are looking for good oysters and shrimp! Friends Grille + Bar is a locally owned neighborhood restaurant specializing in modern, but laid-back southern cuisine that reflects the very best of what the area has to offer. They strive to use local, seasonal produce, all-natural meats, and the freshest seafood. The best kept secret in South Georgia! It's a relaxed, family-owned spot for Greek & Italian cuisine along with live musical performances. Giulio's Greek & Italian Restaurant has one of the greatest dinning atmospheres in Valdosta located in an historic 2 story pink house in downtown! 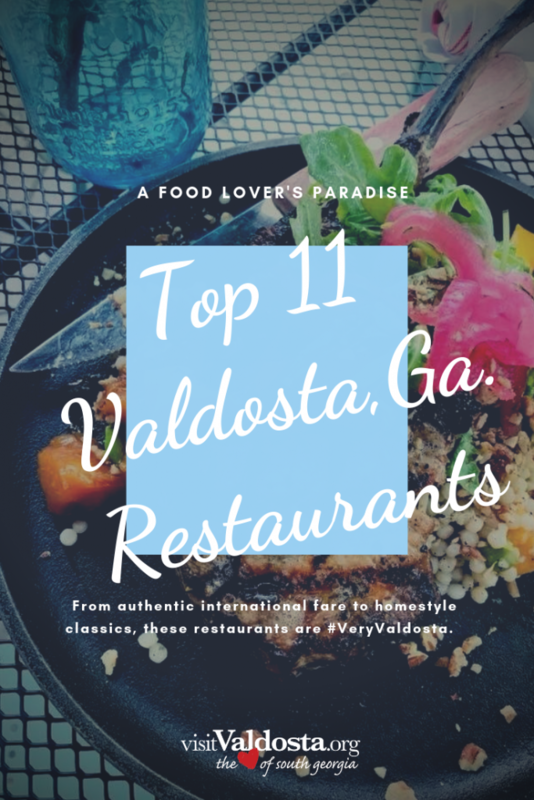 These are only a few of the great restaurants Valdosta has to offer! Find more Valdosta dining here. Sources and information were taken from Google, TripAdvisor & the Culture Trip.